A biological research team at Bielefeld University has made a groundbreaking discovery showing that plants can draw an alternative source of energy from other plants. This finding could also have a major impact on the future of bio-energy eventually providing the evidence to show that people draw energy from others in much the same way. Members of Professor Dr. Olaf Kruse’s biological research team have confirmed for the first time that a plant, the green alga Chlamydomonas reinhardtii, not only engages in photosynthesis, but also has an alternative source of energy: it can draw it from other plants. The research findings were released [in 2012] in the online journal Nature Communications published by the renowned journal Nature. Plants engage in the photosynthesis of carbon dioxide, water, and light. In a series of experiments, Professor Dr. Olaf Kruse and his team cultivated the microscopically small green alga species Chlamydomonas reinhardtii and observed that when faced with a shortage of energy, these single-cell plants can draw energy from neighboring vegetable cellulose instead. The alga secretes enzymes (so-called cellulose enzymes) that ‘digest’ the cellulose, breaking it down into smaller sugar components. These are then transported into the cells and transformed into a source of energy: the alga can continue to grow. ‘This is the first time that such a behavior has been confirmed in a vegetable organism’, says Professor Kruse. ‘That algae can digest cellulose contradicts every previous textbook. To a certain extent, what we are seeing is plants eating plants’. Currently, the scientists are studying whether this mechanism can also be found in other types of alga. Preliminary findings indicate that this is the case. Call back your energy. When we have our energy in our own space there is less room for other energy to enter. But as we focus on other people and projects we sometimes spread our energy around. Create an image of a clear gold sun several feet above your head and let it be a magnet, attracting all of your energy back into it (and purifying it in the gold energy). Then bring it down through the top of your aura and into your body space, releasing your energy back into your personal space. Burning Man poster by Cory and Catska Ench. “Occasionally something will capture your Dreammaker’s heart and you are given a numinous dream. You awake knowing you have come into contact with the presence of divinity. It’s important when receiving such a dream to take a step in the direction of its prompting, offering physical gratitude or a leap of faith, inviting the symbol to come on stronger. Soon, those numinous moments turn into hours, eventually days and, with enough fidelity to your path, a new life is born.” ~ Dreamwork with Toko-pa.
To read more from Toko-pa, sign up for her free newsletter. In the above poster we see an embryo being transformed through a Third Eye experience by what we could call spiraling liminal energy. That would be the “energy of liminality” experienced in a hypnagogic state such as deep meditation or in a dream. It’s hypnagogic because experience of the numinous or divinity is considered a threshold or liminal experience. In the Chrysalis scheme of things, divinity is synonymous with your own Higher Self (destiny), or your transcendent Divine Child (sacred inner voice). Regardless of terminology, the point is that such liminal states, whether they be sleeping dreams, waking dreams or dreams experienced during deep meditation, all originate in the same place. In Chrysalis, we call this originating place the Otherworld in order to simplify terms and grant weighty religious fiddle-faddle a wide berth. That’s why we believe it’s important when using tarot to allow the ego-oriented conscious mind (self with a little s) to wander off and commune in the darkened forest with egoless unconscious intuition, imagination and inspiration (Self). That’s where “numinous moments turn into hours” and consciousness gracefully morphs into Higher Self. People have long accepted that political power is man-made rather than god-given. But it’s been different for gender equality. History, religion, science, everything in fact, has seemed to condemn feminism for being against the natural order. Are there examples of true gender equality in the history of mankind? And if so, how far do we have to go back? It’s hard to get one’s 21st century head around the Catalhöyük settlement, which existed from approximately 7500 – 5700 BC. Its early inhabitants lived at the dawn of agriculture. They had semi-domesticated animals and were learning to sow crops. Not only did women have the same diets as men and inhabit the same physical space, but there were no wider hierarchies in the community. Catalhöyük has a special significance for anyone interested in women’s history. It is the lynch pin in the Mother Goddess argument. According to this theory Stone Age society was matriarchal, peaceful, spiritual and sexually uninhibited. Women were respected for their life-giving powers, and the feminine mysteries were worshipped. In the 1960s, the swashbuckling archaeologist James Mellaart found at Catalhöyük one of the most powerful representations ever made of female divinity. 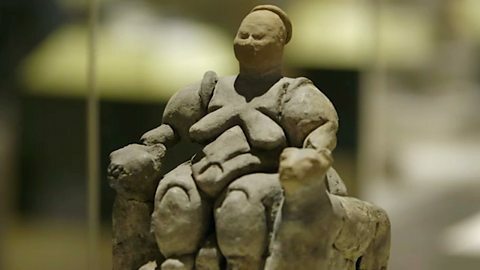 Known as the ‘Seated Woman of Catalhöyük’, or more popularly the ‘Mother Goddess’, it is a clay figurine of a corpulent woman sitting on a throne, flanked by two large leopards, who appears to be giving birth. As he continued his excavations Mellaart unearthed a treasury of female imagery and figurines. For Mellaart, and many others, this was the confirmation they sought for the Mother Goddess theory. Catalhöyük was proof that patriarchy was no more ‘natural’ than the pyramids. When Professor Hodder took over the site, it wasn’t his intention to be controversial. Nevertheless, his findings have been revolutionary. His team dug through 18 levels, covering about 1,200 years of uninterrupted habitation. They found no evidence to support the claim that Catalhöyük was a matriarchy or that female fertility was worshipped over and above that of phallic or animal spiritualism. But, Hodder insists, the question should never have been posed as an either-or issue. He argues that his team’s discoveries are so much more significant than anything previously imagined. Catalhöyük was a place were true gender equality flourished. When did women’s rights begin to be restricted? When did civilisation begin to restrict women’s rights? In 4,000 BC women had equality with men in Ancient Sumer, now modern-day southern Iraq. In ancient Sumer – now modern-day southern Iraq – women enjoyed the same privileges as men in both society and commerce. But when the Akkadian King Sargon conquered, and Sumer became a Vassall state, the outlook for women drastically changed. If a woman speaks out of turn, then her teeth will be smashed by a brick. Later, the Code of Hammurabi (circa 1754 BC) of ancient Mesopotamia proved a mixed blessing for women. The laws recognised the right for women to own property, while also forbidding arbitrary ill-treatment or neglect. In widowhood, wives were allowed to use their husband’s estates for their lifetime. However, the code was a blow to women’s sexual freedom. Husbands and fathers now owned the sexual reproduction of their wives and daughters. This meant that women could be put to death for adultery and that virginity was now a condition for marriage. Some of the starkest double standards exist within the Assyrian laws from 12th century BC. Husbands could abuse (and even pawn) their wives freely, with the only restriction being they couldn’t kill them without cause. Women in Assyria had no rights and many burdens. If they have an abortion they can be executed, if they commit adultery they can be executed. And if their husband commits a crime, they can be punished in his place. Within these laws there are the earliest examples of enforcing the veil, long before it was adopted by the Greeks, Romans, Byzantines, Christians and Muslims. However, not all women are required to wear one. The laws specify that wives, daughters and, indeed, concubines of the upper classes should not go outside uncovered. On the other hand prostitutes were not entitled to wear the veil, and any man seeing a prostitute wear the veil is to arrest her and she will receive ’50 lashes with a bamboo cane’. If a slave-girl is seen to be wearing a veil, she too is to be arrested; in this case her ears will be cut off and the man who arrested her may take her clothes. Dr Amanda Foreman covers and explores the above topics in episode 1 of Ascent of Woman: ‘Civilisation’ on BBC Two 2 September at 9pm. The episode will be available to watch on BBC iPlayer shortly afterwards. In Anatolia, she visits Catalhöyük, one of the world’s earliest settlements, which archaeologists believe held remarkably different notions of gender. 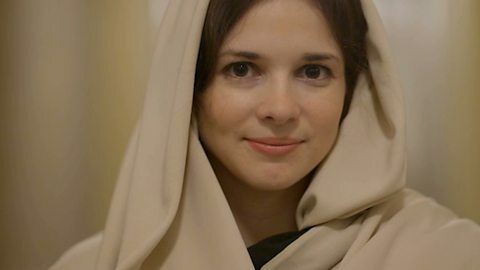 From Mesopotamia, she explores the world’s first law codes written to regulate women’s status and behaviour, including the world’s first known veiling law, two millennia before the advent of Islam. Across Europe and the Near East, she uncovers a group of extraordinary women who created their own routes to power in male-dominated worlds. These include Enheduanna, the world’s first recorded author, the Ukok Ice Maiden, one of the great archaeological discoveries of the 20th century, and Hatshepsut, one of ancient Egypt’s most successful but most maligned ruling queens. Crucially, she also explores the darker legacy of gender inequality in ancient Greece, whose influential ideas on the inferiority of women have cast a long shadow over women’s lives across the globe to this day. Amanda’s approach aims to profoundly alter the accepted view of civilization once and for all.